All the buildings in the Forbidden City are wooden structures. 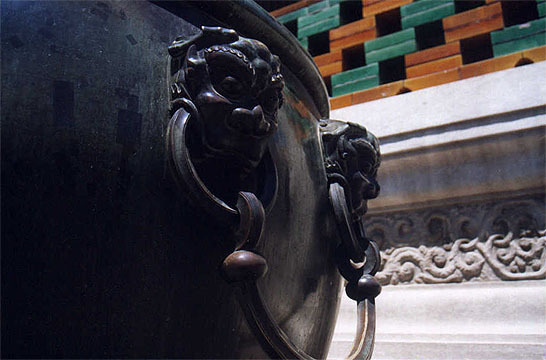 As a measure for fire prevention, iron vats (called "men hai" in Chinese, or sea in front of doors) for water storage are placed through out the Forbidden City. Special heating systems were built underneath each vat to prevent water from freezing in the winter. There used to be a total of 308 of these vats. When the Japanese invaded China, the Japanese melt many vats and used the iron to make bullets.